Photo: Demonstrators at Boston's City Hall Plaza demand that Massachusetts pension fund monies be divested from companies doing business in South Africa. September 16, 1981. Photo @ Ellen Shub. It was the fall of 1978, and South Africa was about the farthest thing from my mind. I was just entering college and knew little of this distant, tortured land. A chance encounter with an anti- apartheid activist changed all that. On a sunny September afternoon during freshman week at Harvard, I was walking up the steps of the Fogg Art Museum to participate, along with a thousand or so of my new classmates, in the quaint ritual of having tea with the college president, Derek Bok. As I approached the front door, a graduate student named Joe Schwartz pressed a leaflet into my hand. "Why don't you ask President Bok why Harvard supports apartheid?" he challenged me. He explained that Harvard had millions of dollars invested in companies doing business in South Africa. I figured there must be some explanation for this, but I was sufficiently cheeky to venture inside and go directly over to the university president. He was cradling a teacup, surrounded by a clutch of awestruck freshman. Was it true, I asked Bok, that Harvard was profiting from apartheid? The students fell silent. Bok pursed into a tight smile. He replied coolly, speaking of the importance of remaining "engaged," maintaining "dialogue," and bringing pressure on South Africa from the inside. I was unimpressed, and frankly disgusted by his explanation. Two years after the police attack on protesting students in Soweto, the white regime that I read about appeared to be utterly unmoved by polite pressure and the occasional diplomatic scolding. The simple reality was that the college president could not bring himself to part with such profitable investments. My anti-apartheid activism began that day. Although I didn't know it at the time, my chance encounter was being repeated on sidewalks, in living rooms, and in workplaces all across the United States. Schoolteachers, longshoremen, investment managers, legislators, and retirees were learning of the ways that they were unwittingly supporting a racist state on the southern tip of Africa. And they were figuring out that they had the power, right in their own communities, to make a difference. These realizations did not come about by chance. The explosion of activism in the 1980s in support of Southern African liberation was the culmination of decades of efforts, reflecting lessons learned from countless past successes and failures. The singular achievement of U.S. activism in the 1980s was the transformation of disparate African solidarity movements into a focused, multiheaded, and surprisingly successful anti-apartheid movement. My own engagement reflected how the movement had spun off numerous local-- even neighborhood-- initiatives. As a college activist, I joined efforts to force Harvard to divest itself of the approximately $1 billion that it held in companies doing business with South Africa. I worked with Harvard's Southern Africa Solidarity Committee, helping organize demonstrations, teachins, debates, and fasts, and constructing a South African--style shantytown in Harvard Yard. In 1983 I was involved in launching the Endowment for Divestiture, an alternative donation channel for Harvard alumni who wanted to pressure the university by contributing to an escrow fund that would only be turned over to Harvard after it divested from South Africa. Following college, I was active in several Boston-based anti-apartheid groups, and I participated in demonstrations aimed at stopping the sale of Krugerrands. I was mostly just a foot soldier in these efforts, one of thousands around the country engaged in the seemingly quixotic challenge of smashing the pillars that supported apartheid. My involvement in the divestment movement led me to want to see for myself what the apartheid of my protest chants was about. Themba Vilakazi, a friend who was a longtime member of the African National Congress, told me, "You should go to South Africa if you can get in. But," he added, "when you come back, you will have a responsibility to tell people about it." In 1984, as a budding freelance journalist, I journeyed to Zimbabwe and South Africa. I chronicled what I found there for a variety of U.S. and British publications and ultimately wrote a book about that and subsequent visits, Fault Lines: Journeys into the New South Africa (Goodman 2002). In this chapter, I tell the story of U.S. activism in the 1980s by focusing on representative examples of antiapartheid activism in three key arenas: local, national, and international. At the local level, I take as a case study the organizing that happened in Massachusetts, which led to passage of the nation's first statewide divestment initiative in 1983. Former Massachusetts state representative Mel King and Massachusetts Institute of Technology professor Willard Johnson were at the center of these struggles. The national picture is represented here by Jennifer Davis and Dumisani Kumalo, both of the American Committee on Africa, and by the work of the Free South Africa Movement launched in Washington, DC by Randall Robinson. Finally, Ted Lockwood, who spent the 1970s as director of the Washington Office on Africa and the early 1980s as the international affairs representative for the American Friends Service Committee, fills in the international dimension of the solidarity effort. South Africa may be an ocean away, but when I arrived to start college in Cambridge in 1978 it was a hotly debated local issue. Massachusetts, I quickly learned, was a key outpost of the U.S. anti- apartheid movement. The first university divestment and the first full divestment of a state pension plan took place there in the late 1970s and 1980s. Chapter 4 on the 1970s recounts the story of the Polaroid Corporation in Cambridge and how workers there made South Africa a local issue. It also relates the early organizing done by Randall Robinson while he was a Harvard Law School student and before he became executive director of the African American lobby TransAfrica. 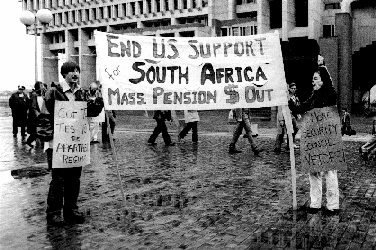 In the late 1970s, students in Massachusetts took up the cause of South African divestment. The first school in the country to divest was Hampshire College in western Massachusetts in 1977. The Southern Africa Solidarity Committee at Harvard, of which I was a member, formed during this period. It brought members of African liberation groups to campus, held material aid drives for Zimbabwe, and sponsored concerts by Abdullah Ibrahim (Dollar Brand) and Bob Marley. Around the city, the Boston Coalition for the Liberation of Southern Africa (BCLSA) played a key role in building a larger divestment initiative. A key member of BCLSA was Themba Vilakazi, Boston representative of the ANC. In 1985 Vilakazi formed the Fund for a Free South Africa (FREESA), which became the de facto leader of anti-apartheid work in the Boston area. Two African American leaders played central roles in anti-apartheid efforts in Massachusetts. Mel King is a lifelong community activist in Boston. He headed up the Boston chapter of the Urban League in the late 1960s--described by a fellow activist as "the first Black Power Urban League chapter in the country"--until his election as a Massachusetts state representative in 1972. Willard Johnson was a professor of political science at the Massachusetts Institute of Technology for over 30 years, until his retirement in 1996. The founder and head of the Boston chapter of TransAfrica and a member of the group's national board, he was a guiding force in numerous African solidarity efforts around Boston from the late 1960s onward, and he spearheaded Boston's Free South Africa Movement in the 1980s. Massachusetts was among the first states to put issues of African liberation before state and local political bodies. In 1973�74, for example, state representative Mel King introduced a bill in the Massachusetts legislature aimed at preventing the port of Boston from handling Rhodesian chrome. This strategy was conceived during a visit to Boston by ANC president Oliver Tambo in late 1969 or early 1970. Tambo met activists at the home of Willard Johnson in suburban Newton. Among those in attendance was Mel King. Johnson recalls, "What Tambo was essentially pointing out was that there are ways to use legislative and governmental machinery at the local level on these foreign policy issues." Mel King's focus on South Africa was a natural outgrowth of his racial justice work in Boston. He explains, "One's involvement in [anti-apartheid work] is based on one's understanding of the racial nature of this society. And so a situation like South Africa is just an extension of here. So if you're working on it here, you see the relevance of working on it anywhere it exists." Continued on pages 154-166, Order book.